Maddigan, J. (2010, October). The Psychology of Shooters. Game Pro, 34-39. Groen, A. (2010, October). The Science of Game Weapons. Game Pro, 62-67. This magazine is a not only a gamers’ best friend, but an incredibly thoughtful magazine that not only includes game advice, but poignant editorials about the love of the game. ‘Tweens, ages 12 & up, will learn more about the psychology and the reasoning behind various video games including the motivation and creation of popular, high tech games that will surprise readers. GamePro provides readers with a variety of topics each month ranging from new game releases, video game console innovations (i.e., gaming accessories), game reviews, articles about program glitches, commentaries/editorials by staff and guest contributor that focus on many issues such as video game concepts and why shooting games are not that great. 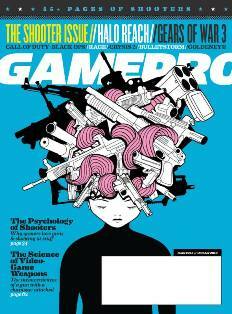 Each issue of GamePro contains a feature spread on a particular game or genre; the October 2010 issue is the “Shooter Issue” that has articles that look at all aspects of the genre (i.e., why gamers love these types of games) as well as stories about the character conceptions and graphic design. In addition to the spread, every issue contains a review section, the “Inbox,” which allows readers to voice their opinions and “Bonus Level” that highlights different products (i.e., strategy guides, historical gaming events, etc.). Everything technical can be found in this magazine, which inspires prospective video game designers and feeds the gamer soul with lots of background information not found in the game, itself. Gamepro is for the avid gamer who desires to know more about the reasoning behind specific video games and how gaming itself is a part of pop culture not only as entertainment, but as a real science.